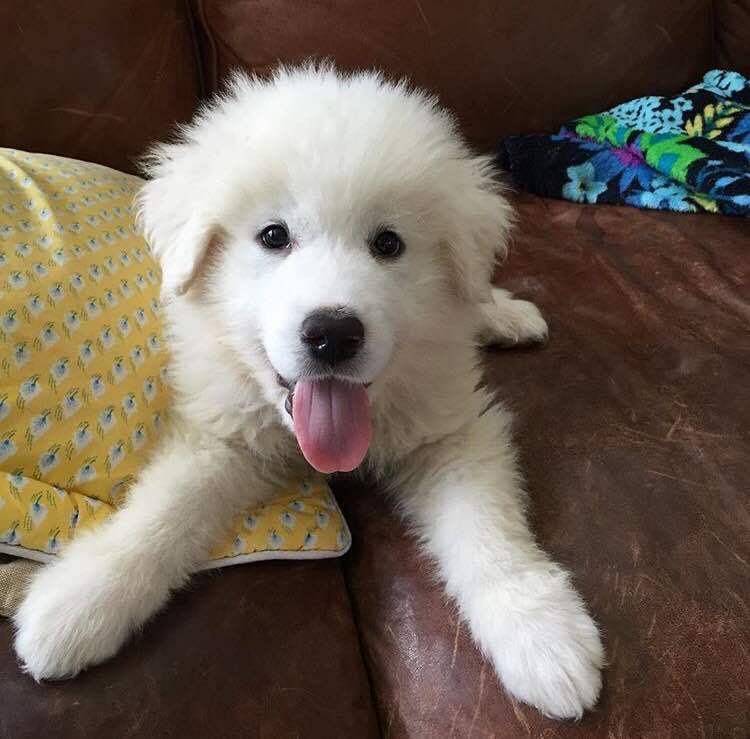 Great Pyrenees Owner Interview: What's It Really Like to Live with One? 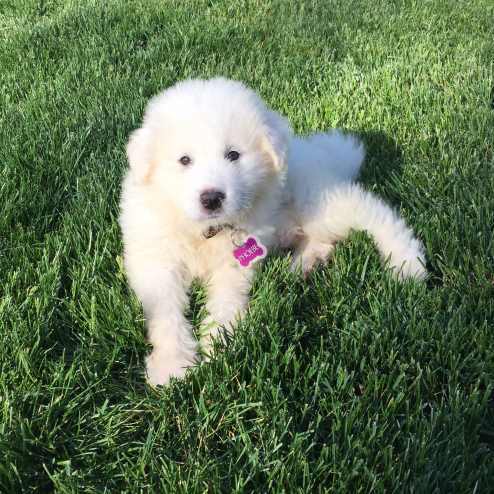 A big Thank You is extended to Sean Smith from Hudson Ohio, the United States, for taking the time to share his thoughts about his new puppy, Phoebe. Can you tell us a bit about your Great Pyrenees? I got Phoebe from a large litter of puppies around April 20th, 2016. She was 6 weeks old at the time, although, it’s recommended that they are brought home a bit older than that. Phoebe is a little ball of fun, but she hasn't stayed little for long. Already she had gotten much bigger than when I got her, only a couple weeks ago. How easy was she to train? I am currently in the training process with Phoebe. The Great Pyrenees are very intelligent dogs, and this has become quickly apparent. It did not take long for her to realize where to go to the bathroom, and her quick growth has helped her wait in between bathroom breaks. This being said she is a bit mouthy. Whenever she nips with her sharp puppy teeth, I stop all interaction and clearly say, “No,” before continuing. Altogether, consistency is key. How much exercise does she need? Phoebe is still a puppy, so she has gotten most of her exercise terrorizing the furniture and bounding about my house. This being said, as an adult, she’ll need regular, daily exercise. I plan on accomplishing this by walking her for an hour each day, as it’s especially important with these larger breeds to maintain their weight and health. It also keeps the dog calmer, as it helps rid her of any excess energy that could be spent chewing on the couch. Does she have a particular doggy smell? Phoebe has not been a very aromatic dog, which pairs suitably with her bright white coat. The only scents she’ll pick up are those that she has rolled around in. These are quickly removed with a bath, however. Being a puppy still, she will get some urine on her back legs when she goes to the bathroom. I often just dry her off with some paper towels before I let her back into the house. Phoebe has started to shed quite a bit already. I’ll often end up vacuuming my carpets twice a day. On top of this, I brush her every other day to remove and shed hairs that get caught in her coat. Her shedding is not a huge issue so long as you keep up with it, although, I would not recommend this breed for people with, particularly bad dog allergies. Bark, no. Yap? Yes. For most of the day, she is quiet except for the occasional burst of yapping at passersby or my cat trying to slink about the house. During the night, however, she is a bit more animated. I put her in a crate at night, to which she makes her displeasure very known. I'll sometimes wake up to these same bursts of yapping, although, they often just remind me to let her out to go to the bathroom. What is she like around other dogs? I have two other dogs, both of which took a bit of time getting accustomed to the new puppy in the house. Once they got over hostilities, Phoebe has gotten along with them just fine. She is very playful, although, I'll often monitor her to make sure she isn't nipping through one of my other dog’s ears. With strangers’ dogs, she’ll often yap at them, but not make any sort of approach, as she is already fairly bound to the property. Do you have any other pets besides dogs? I have a cat named Salem who becomes the unfortunate target of this marauding puppy. It’s a good thing Phoebe is still short and clumsy, as it allows Salem to make a quick getaway most of the time. Sometimes they can share a room, although, often Phoebe will bound to meet her and greet her to play. She isn't aggressive with the cat, but she will sometimes mouth her, which I'll stop as soon as possible. How is she around children? Given that I don't live with any kids, she hasn't had too many opportunities to interact with them. When she has been met by children around the neighborhood, they have often treated the same way as any adult. When they pet her, she’ll be a bit docile at first, although, as she gets more comfortable she will become more playful and devious. Altogether, she behaves fairly well around them. Would you consider her a fussy eater? I'm actually considering whether or not her stomach is bottomless. She enthusiastically gobbles up any and all food that is placed in front of her. When I'm not feeding her, she’ll be on watch for any food within her reach. This is easier at the moment, although, when she gets bigger it may become more of an issue. I have kept a consistent standard of no table food, but I'm sure she'd get to it if she got the chance. How much time does it take to groom her? She is not very time consuming to groom. In fact, it's quite enjoyable. She was a bit fussier when I first got her, but she's become accustomed to the frequent brushing. Teeth brushing came with a bit more struggle, although, she came around. When it comes to clipping her nails the only extra thing to look out for are her dewclaws, which I clip with the rest of her nails, only a bit less often. Phoebe is a very quiet, independent puppy. There are times I'll see her doing her own thing and exploring the home. There are also times where I don't see her at all, so you have to be pretty vigilant to make sure that she doesn't get into any trouble. She has a particular tendency to go and sleep on the tile floor in one of my bathrooms, so I'll often find her there should I lose her. Any further advice for people considering getting this dog? I would recommend just being very vigilant as to the dog’s location when training. As adults, they are known to be independent, so it's less of an issue then. With training, it is of paramount importance to make sure you are consistent. These dogs are smart, and they pick up on any slip-ups. However, with consistent training and effort early on, the Great Pyrenees proves to be an amazing, fun, and calming companion. 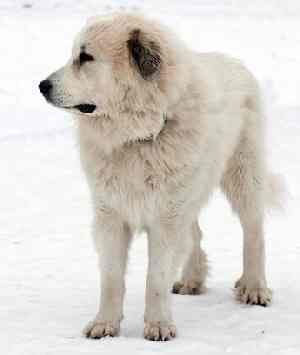 For more information about the Great Pyrenees, may I suggest you check out our breed profile. You'll find in depth information on temperament, history of the breed, training, health, grooming, and more. See for yourself if this is the breed for you. Are you interested in the telling the world all about your dog? We would love to hear about him/her or them. All of our interview pages have the same general layout and you can download a copy of questions that most people want answers to. How to submit? 1. Download the interview questions. 2. Use the Form below to submit your answers. 3. Fill in the form with your answers. You can copy and paste or just type on the form. You do not need to rewrite the questions. 4. I will respond via email and you will then be able attach several good photos of your dog directly to the email. 5. Breeders, Rescues: Do you want a link to your website or Facebook Page? Don't forget to add this information when you submit your answers. That's all there is to it! Now, Make your Dog our Next STAR!